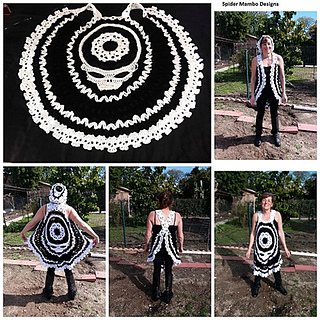 RIP Circle Vest with directions for an optional Hood. 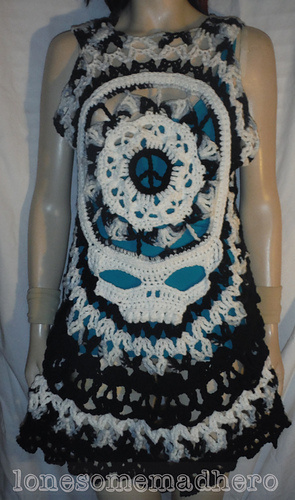 It can also be made as a fly back tunic with chriss cross straps , worn backwards with the skull in the front. 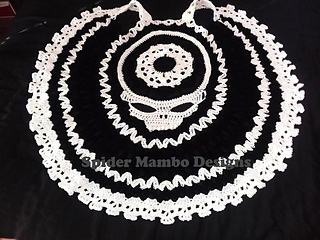 The large center skull contains a peace sign (hence the name RIP) and a smll ring of creepy skulls. There is another Row of Wikked skulls with puff stitch teeth in the middle. The border has even more tiny wikked skulls. Pictures of many of the steps. Large Size Range. It is simple to make even larger, by adding more shells to the fronts before the addition of the border.